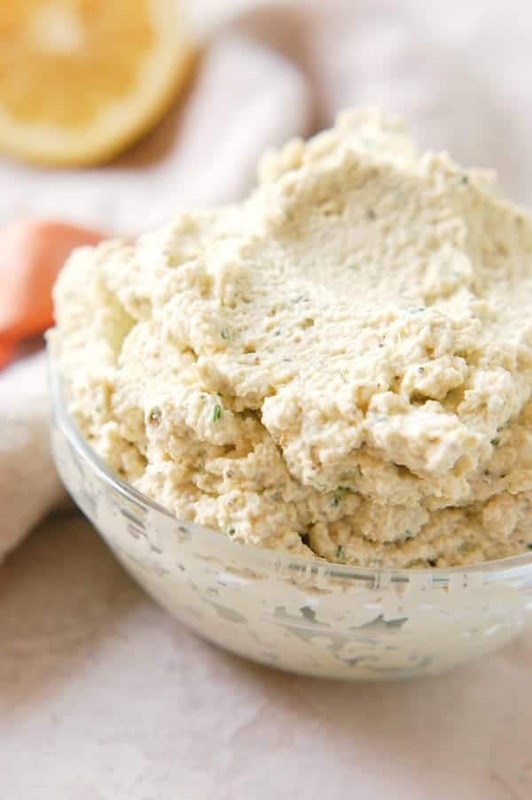 An easy recipe for learning how to make vegan ricotta cheese. 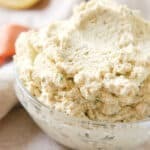 This recipe has no cashews, is completely nut free, and is easily the best vegan ricotta recipe! We like to add it to lasagna, stuffed shells, put it on pizza, the list goes on! 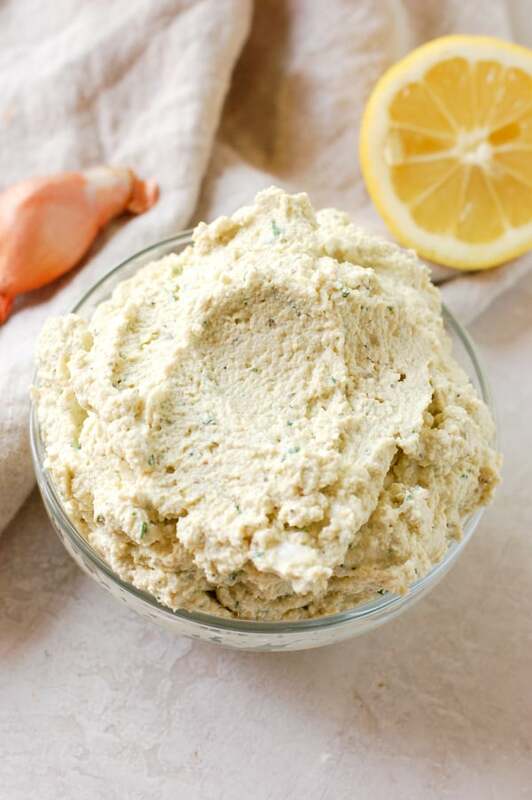 Easily the best vegan ricotta cheese recipe in the world. Bold statement but it is the dang truth! 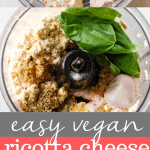 Seriously, I can literally feed an entire crowd with this plant based, healthy tofu based ricotta cheese, and not one single meat eater or dare I say, Italian, in the room would flinch to think it wasn’t actually ricotta cheese. Yep…tofu! 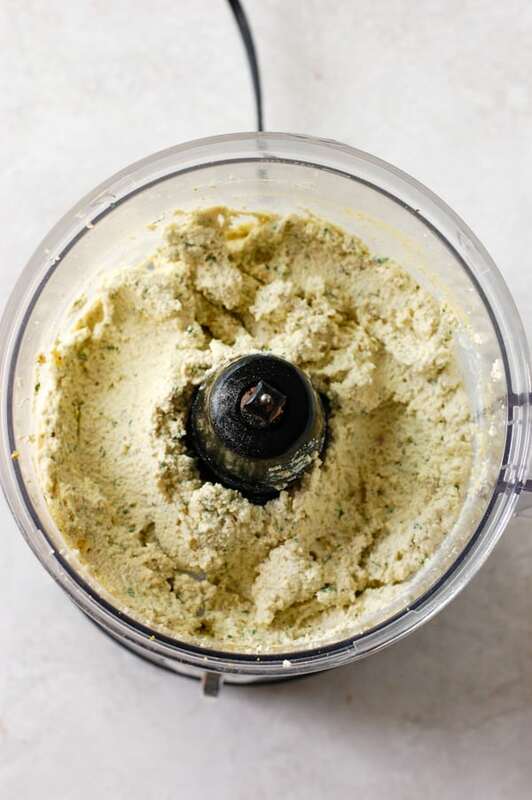 That’s the secret ingredient here, but it works so well as a vegan ricotta cheese because the texture is literally the exact same as ricotta when you give it a pulse in your food processor. Then when you add other plant based vegan ingredients like nutritional yeast, shallot, garlic, fresh basil, it really takes the flavor to the next level. This recipe is completely nut free, so no cashews or almonds here, and it’s loaded with healthy and wholesome ingredients that will literally make you want to find any way to eat it. It seriously goes well on everything, like seriously everything. We put it on our pizza, make stuffed shells out of it, add it to lasagna… the list goes on. 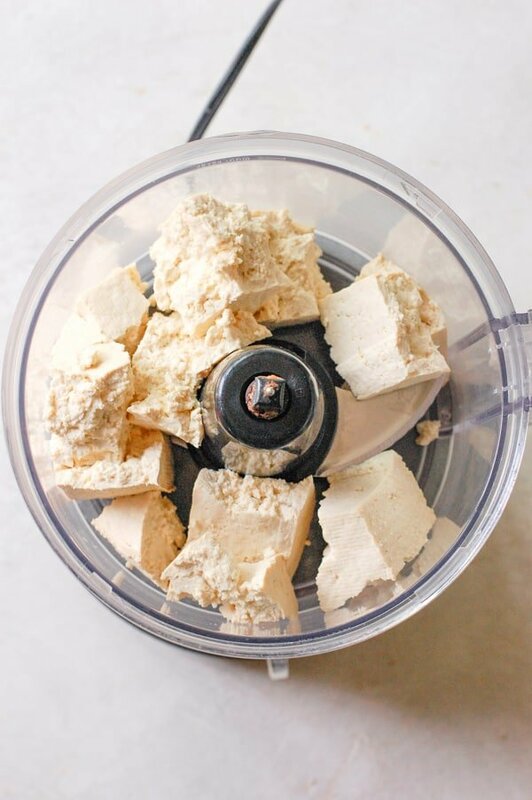 Seriously, all you need to do is press your tofu, then blend it all up in a food processor. That is it. It’s ready in less than 15 minutes flat. 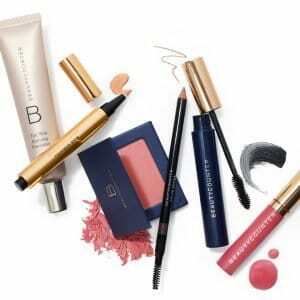 The ingredients are flexible and can be swapped if you want to put your own twist on it! If you want it to have a more basil taste, go ahead and add more basil. Same with garlic, salt and pepper. Adjust to your liking. If you don’t have nutritional yeast, you can leave it out but it won’t be as cheesy. The best part about it, is that it is a simple recipe and takes little to no time to make. Plus it yields a good amount, so you get to eat it for a long time! Start by pressing your tofu, once you’ve pressed it for about ten minutes (I stick mine in between two plates and place a cast iron skillet on top! ), crumble into blocks and place in food processor. Pulse until you have fine crumbles. Add in your shallot, basil, nutritional yeast, garlic, salt, pepper, and oregano, and blend until well combined, scraping down sides as needed. Add in olive as it’s blending, until it reaches the consistency you like. For the above photo, I used about 2 tablespoons. That’s it! So simple to make. You can serve it cold or warm! 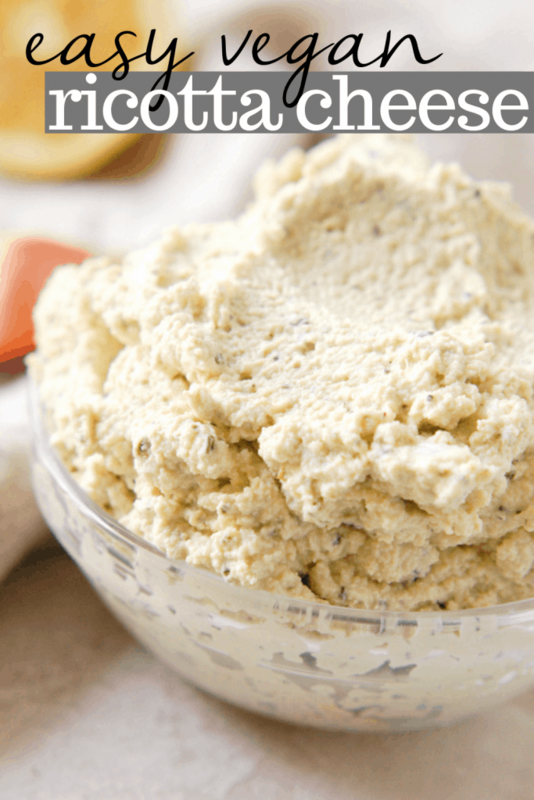 Learn how to make Vegan Ricotta Cheese that is so creamy, flavorful, and made with a special ingredient! One block firm tofu, pressed + dried for 10 minutes. 2 tbsp – 1/4 cup olive oil depending on desired consistency. Press tofu either in a tofu press or by sandwiching between two paper towels and putting a stack of heavy books or pot on top. Let stand for 10 minutes. 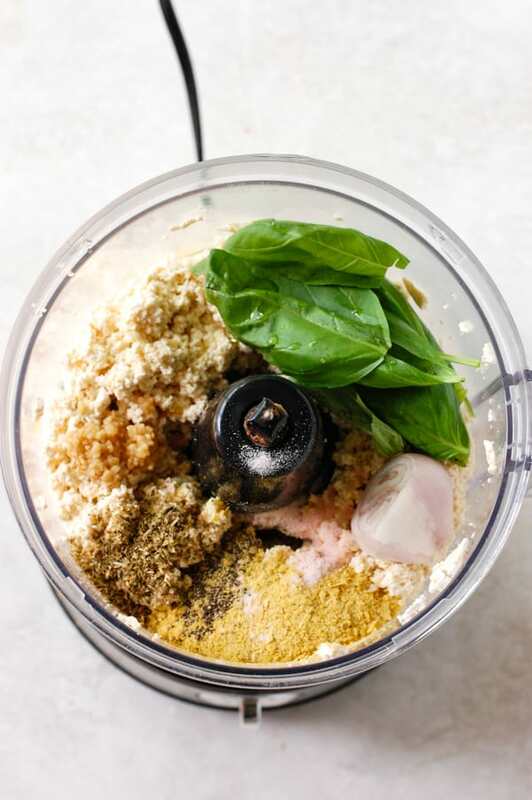 Crumble up tofu into blocks into food processor and blend until small crumbles. Add in lemon juice, yeast, basil, garlic, shallot, salt, pepper, oregano and blend again. Scrape sides down and then blend again. Slowly add in olive oil while blending until reach desired consistency. Serve over pasta, chilled as a dip, or on toast! Hi! I am so excited to try this recipe! I just have a quick question. If I don’t have a shallot, can you replace the shallot with an onion? If so- what would be the ratio? Since I know onions have a stronger taste I think.